The Amazon Kindle Fire is my favorite Christmas present. It is all as advertised, and more. It is a book reader, and a web surfer. It is not a great pad computer like the iPad, but costs hundreds of dollars less than an Apple iPad. My Kindle Fire is exactly what I wanted. I did not want another computer to carry around. I already have a nice laptop, and neither the iPad or Fire can do what the laptop does. Both the iPad and Fire are entertainment devices, but the primary purpose of the Fire is as a Kindle book reader. Like the iPad, you can also subscribe to magazines, and watch streaming videos, and take care of your email. But, with my laptop I can do actual work for which the iPad and Fire were not designed. The neat thing about the Fire is that you have immediate access to your Amazon account, and can rent or purchase content from Amazon, or get free streaming movies, too. Don’t worry about running out of memory. Amazon stores all your stuff in the cloud, accessible with the built-in WiFi. 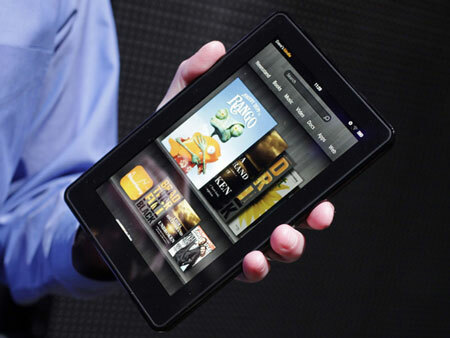 One of the desired features of the Kindle Fire is that it is a computer that runs on the Google Android operating system. Lots of mobile devices run Android, including smart phones, pad computers, and my great little Kindle Fire. According to Google, 3.7 million new devices running the Android system were activated over the two day Christmas Eve and Christmas day period. Even more Apple IOS devices were activated. These were a mix of iPhones, iPod Touch, and iPads. The message, here, is that the mobile computing market is here to stay, and the killer applications are entertainment media. Books, magazines, newspapers, music, movies, YouTube videos, and games dominate the usage of these devices. It’s all stuff with which to pass time, and this says volumes about our society. Think of being able to take your entire book library on a trip, or to jury duty, or to the doctor's office. You never run out of entertainment. It's just cool! Oh gosh! Not another person with a Kindle.I am going to remain obstinate and continue to read old fashioned books. Yep, yep.HAPPY NEW YEAR! !